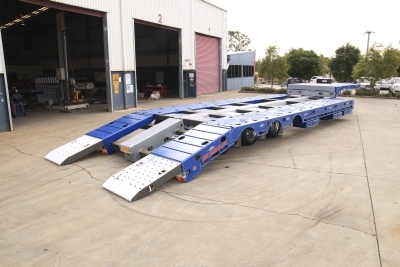 Australian custom-built trailer manufacturer Tuff Trailers is being recognised for its innovative mono-spine ‘Load ‘N’ Lift’ trailer design with a nomination for a prestigious Swedish Steel Prize. Owner and CEO of Tuff Trailers (QLD) Pty Ltd Denis Di Pasquale saw a need for a wider, lighter and safer trailer to transport large agricultural, mining and construction equipment. The new-concept ‘Load ‘N’ Lift’ design widens from 2.5 to 3.5 meters through hydraulic cylinders that push the decks apart from underneath. At the same time, the rear end of the trailer extends to 3.1 meters and lowers as it widens to act as a ramp – meaning that extra-wide machinery can be loaded within minutes. 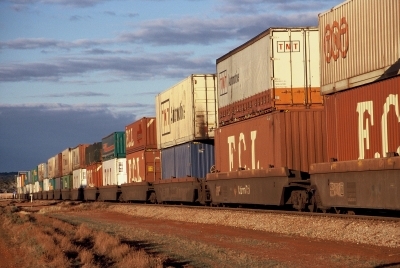 The additional width negates the need for a trailer with pullout riggers – a much more labour-intensive and time-consuming way of expanding the trailer’s width. The retractable ramp makes the trailer more aerodynamic, reducing drag and fuel consumption. The hydraulically controlled mechanism takes just a few minutes to expand width-ways and to lower the loading ramp. This is the first-ever trailer to feature a mono-spine chassis. The single beam is shaped like an upturned ‘U’, while the base is covered by a welded plate that fixes the structure in place. Tuff Trailer’s Computer-Aided Design (CAD) team – twin brothers Matt and David Dengate – used computer-based software to calculate fatigue stresses and to develop the design concept. The chassis’ cross-members each have the same profile and pass through precise plasma-cut holes on both sides of the main frame. The cross-members are supported on both sides at centre of the chassis, making the structure very stable. The inspired chassis design concept has been nominated for a prestigious Swedish Steel Prize – an award that honours innovative designs made using high-strength steel.